Are you considering starting a garden this year? While I don’t talk about it much (which I’m hoping to change) I truly love plants. I have loved growing edible plants and some other plants indoors, and am hoping to experiment with an actual garden this year. My only issue is that I am very much an amateur. One of my goals this year is to learn more about gardening and I have been trying to find various books to help me with the entire process. Luckily, I recently had the opportunity to review a new book that seemed perfect for helping me start my garden – Grow Something Different To Eat: Weird and Wonderful Heirloom Fruits and Vegetables For Your Garden by Matthew Biggs. Once it arrived, I couldn’t wait to start learning! Discover more than 50 out-of-the-ordinary edibles, from cucamelons to strawberry popcorn, in this seed-to-plate guide that inspires you to cultivate amazing new fruit and vegetable crops. Whether you’re a beginner and determined to make the most of limited space with a truly unique and heirloom harvest, or a seasoned grower looking to spice up your cooking with gourmet flavors, the step-by-step instructions give you the confidence to grow some unusually tasty crops. Choose from fruiting vegetables such as orange eggplants and hyacinth beans, salad greens such as fiddlehead ferns and sushi hostas, grains such as quinoa and chia, and luscious fruits such as honeyberries and white strawberries. All plants can be started indoors and transplanted, grown outdoors in the garden, or kept as houseplants. With versatile gardening advice for growing in a variety of spaces and situations, plus cooking suggestions and preserving options, a weird and wonderful harvest is guaranteed. As someone who is fairly new to gardening, I have to say that I absolutely love this book. Honestly, it is one of the best gardening books I have in my collections since it has so much wonderful information in the front of the book for new gardeners, and then even more detailed information for each plant. Unlike most other books, it also includes pictures of EVERY plant. Honestly, I am amazed they can fit so much information on a page without it looking crammed. Instead, each page is beautifully designed with graphics that makes each plant page extremely helpful. I am even more excited about gardening this year after receiving this book. 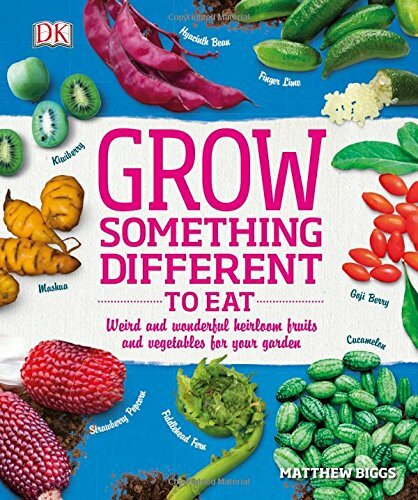 If you are looking for a great guide for gardeners, I highly recommend adding Grow Something Different To Eat to your collection! Would you like to purchase this book for yourself or someone special who loves to garden? You can buy Grow Something Different To Eat on Amazon.com for only $14.55 in paperback. We are certain that gardeners of all levels will find something to love in this fun book! Eating your own veggies that you grew is definitely something special. What an awesome book! My step-daughter tries to grow one new thing every year in her garden – this would be a great gift for her and her family. This book seems pretty cool. And I am looking to expand my garden and some of these sound great. This sounds like a really good book. Great gift for a gardener in your life! I am an avid gardener and would find this interesting. It seems each book has a different view or maybe a new thing you hadnt seen before. Growing a garden is fun and economical. This book sounds like a true find, and sure whets my appetite to be able to have a garden and try a few things different than the usual. Once I special ordered horseradish root to grow, but a vole at the entire thing, you couldn’t tell it had ever been planted! Gourmet vole! Ok, this sounds like such a cool book – I think I am going to send away for it for next year’s garden, I like the thought of different foods to grow instead of the same things over and over.